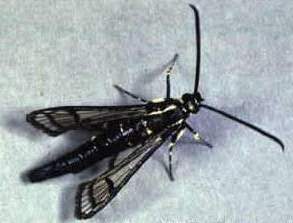 Region: This borer is common in the southern and eastern United States, but similar species can be found throughout North America. Life cycle: This insect produces one generation each year. The larva hibernates in burrows or in the soil, just below the surface. Pupation occurs while the caterpillar is in the burrow and a silk web can be seen at the opening. Physical Description: The caterpillar is a pale yellow or white with a brown head. It is usually one inch in length. The adult is a clear-winged moth that is metallic blue with yellow marks. The moth is much like a wasp and is 1 1/3 inches long. The eggs are laid in the crevices of the bark. Feeding characteristics: This borer likes to work on injured limbs and trunks. You can tell a borer is present by the gummy masses of sawdust oozing from holes in the upper portion of the trunk and branches. The common trees that are affected by this pest are the apricot, cherry, and peach. Controls: In the spring, try surrounding the trees with about a two-inch wide ring of tobacco dust. Use a sticky material like Tanglefoot or Stickem around the lower trunk and branches to trap the moths. Cut off any injured areas or branches and burn them.